So The Legal Genealogist is in Seattle for the 36th annual conference of the International Association of Jewish Genealogical Societies and, last night, was privileged to provide one of the conference’s keynote addresses. But it was also a lot of fun because it produced one of those moments that seem to happen so very often in genealogy. One of those moments of serendipity. Either way, it was in full swing last night. 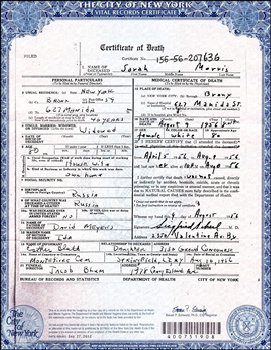 One of the examples that I used in the talk was a 1956 death certificate from the Bronx, New York. It was that of a woman who had been born in Russia, was still a citizen of Russia at the time of her death, but had lived in New York for the previous 46 years. The point I was making was that one single document gave us clues to three different women: the deceased; her mother, whose first name had appeared on the certificate; and her daughter, whose married name appeared as the informant for the certificate. I had no sooner finished speaking than one of my genealogical colleagues came up to me. Emily Garber and I are both genealogical bloggers (her blog is (going) The Extra Yad and I strongly recommend it, especially if you have Jewish ancestry!) and we’ve been friends for some time. We had breakfast yesterday. We share a commitment to standards and to genealogical excellence. And guess whose great grandmother was that Russian woman reflected in that death certificate? It was Emily’s great grandmother’s death certificate I had happened to choose out of all the examples I might have had available to make that point. And I’ve had that happen so many times before. It’s those coincidences of life on the road that make this so much fun. Great post, Judy! I was in Edinburgh in May with my genealogy tour. One participant was from Dryden Ontario and was talking about the first postman, who happened to be the gt grandfather of another participant! There is a monument to him in Dryden. Another participant is doing a DNA study and discovered another participant is researching the same people she is studying! Love genealogy serendipity! Not surprised it’s not just me this happens to! What a hoot! Judy, obviously we need to get you back again to Seattle where I will pick you up at the airport, take you to your hotel, take you to the venue, back to the hotel, sing you a goodnight lullaby if needed, whisk you back to SeaTac and you can miraculously work the “missing” marriage certificate of James Ahern and Jane Graham, about 1858 in Millstone or New Brunswick, NJ into your talk. Sorry I missed you this trip. I promise I’ll be healthy next time around! You have to promise to stay healthy, for sure!! 🙂 Hope all is well and you’re feeling better now. Getting there. Not sure if the ProGen homework (citations) is making me feel better or worse! You have to love these moments, for sure. Yes, this was tres cool, Judy! I am, of course, curious about how/why you came upon my ggm’s death cert. After all, a 1956 record in NYC is not a snap to acquire. I’m sure it was one of the documents I scarfed up in a Google image search, Emily — the image is one of the first ones that pops up if you search New York death certificates — and the citation should have credited your website, in that case, as well. But I filed it away because it’s such a good example of a certificate that’s so important in researching women since it ties three generations of women together. I have had those serendipitous moments happen so often in my research and when helping others. Gives me goosebumps every time! As I zoomed in on the death certificate, I could make out that the deceased lived at 627 Manida Street. The SAME apartment house that I lived in between 1944 and 1952. Sarah Morris is not a name that I recall from my years there but I was just a tyke and there were 25 apartments in the building. So serendipity continues. Great post.